My rule to not do anything Christmas prior to Thanksgiving holds true except for when it comes to planning. Before Thanksgiving even comes, I like to have our main Christmas plans in place so that way we can sit back and simply enjoy the season together as a family. 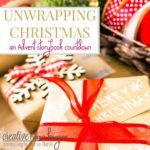 During November I intentionally make our plans for how we will celebrate Advent and get all the supplies together for our Christmas book unwrapping and Truth in the Tinsel activities. I also pretty much have a list of all the Christmas shopping I need to do, including both meal planning and gifts to buy. Most of the time, I really try to have all the gifts purchased before December because I hate going out in the crowds. I know many of you are in the same boat too. You like to have a plan in place and perhaps even like getting all of your Christmas shopping done now too. Rather than wait until December to share my holiday gift guide, I’m going to be breaking it up this year and sharing a little bit over the next three weeks. 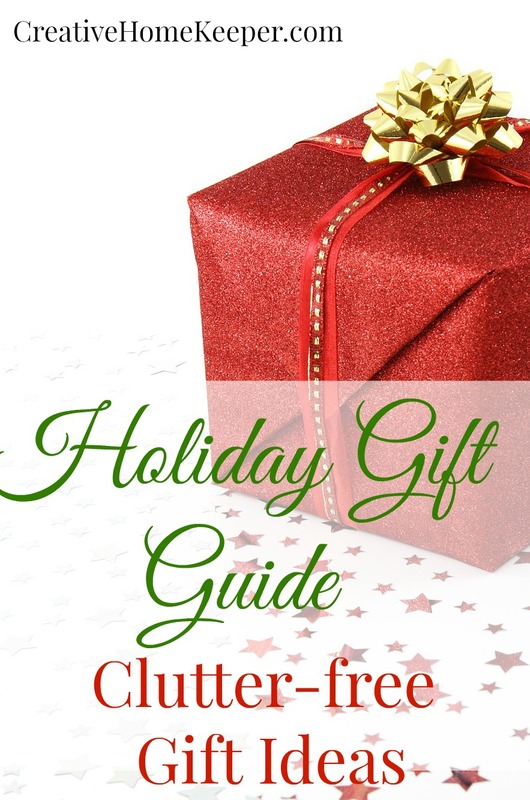 Up first in this edition of the 2015 Holiday Gift Guide… Clutter-free gifts! Looking for some practical, creative and clutter-free gifts to give this year? Well I’ve got you covered! Here’s a list of various options that should please just about anyone on your lift this year. Gift cards seem to get a bad rap because many view them as impersonal or lacking in creativity. While they can come off that way if you don’t think of who you are buying them for, they can actually be personal and wonderful gifts to give. I personally love receiving gift cards, and with a little thought into who you are buying them for, the person receiving one from you will also love it too! Plus this time of year you can also get really great deals on gift cards too. I’ve seen many stores offer deals like Buy $100 worth of gift cards, get another $25 gift card for free. Or sometimes if you buy the gift card online or even through a reputable deal site, you can find discounted gift cards too. Just do your research. While the gift card itself can be a wonderful gift on its own, sometimes you can step it up a bit with a themed add-on. For example last year my SIL gave me a high-value Starbuck’s gift card inside a brand new travel aluminum coffee mug. Or if you are giving a gift card to a movie theater, perhaps you can add a few boxes of their favorite candy. Dressing up the gift card can make the whole experience of giving and receiving very personal indeed! 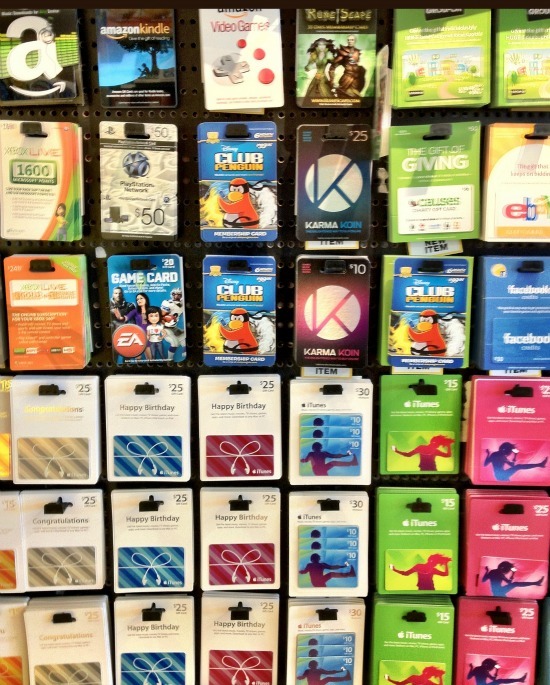 So what kinds of gift cards are great to give? Favorite Restaurant, Ice Cream or Coffee Shop or Cafe :: Perfect for family dinner’s out, date nights or just for some much needed alone time. 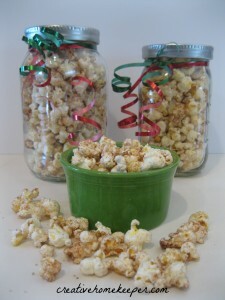 Movie Theater or Movie Rental :: We all know a trip to the movies can be expensive so these are great gifts to give. Either for a fun date night out or a gift certificate to Netflix for a fun, family night in, don’t forget the popcorn and favorite movie candy! Gas :: Perfect for anyone who drives a car, especially for college students who drive back and forth from home to school. Favorite Store or Mall :: If you know their favorite store or place to shop, this is probably the most special. Groceries :: Gift certificates to the person’s favorite grocery store or big box store (Target, Wal-Mart, etc.) are super practical and make great gifts. Visa, Mastercard, or American Express :: When in doubt of what their favorite store or activity is, a generic gift card is always your best bet. Sporting Event, Special Event or Concert :: While you could give a ticket to a special event itself, if you know they are already going, you can give them a gift card to use there. Every year my husband gets gift cards to use especially at the Royals baseball games, either in the concession stands or in their merchandise store. Spa or Salon :: Who wouldn’t love to be treated to a little pampering? I’ve received several gift certificates over the years for spa services like massages, facials and manicures and they are always well appreciated. Sometimes we, women especially, have a hard time spending money on ourselves but when it’s gifted to us it’s such a treat! Amazon :: If you know someone who does a lot of online shopping, or is just a book lover, Amazon is a great gift card to give. Teenagers, who are notoriously hard to shop for, are excellent recipients of cash. I vividly remember one year my grandmother sending me and my brother on a scavenger hunt around the house on Christmas morning to find her gift of money. Some place she left a few coins with clues all while leading up to the big jackpot at the end. 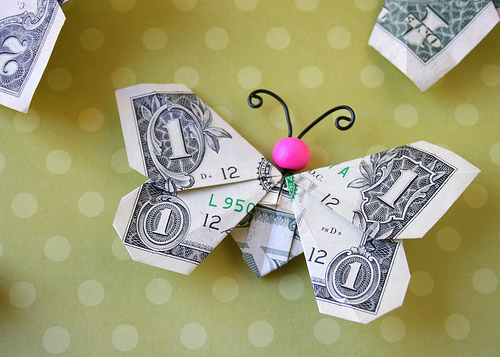 While the way you give cash can come off impersonal, I think there are many thoughtful, and even fun, ways to give cash as a gift. Scavenger Hunt :: Like the one I mentioned above, hide several small clues inviting the person to collect some money along the way. Inside an Ornament or Trick Box :: During that scavenger hunt my grandmother set up, the clue led me to a clear plastic trick box filled with the big dollar bill. It took me forever to figure out how to open it but it was so much fun trying. Another idea is placing the cash inside a special ornament or keepsake. Money Tree :: If you are especially crafty, you can create a beautiful money tree or other masterpiece made up of bills and coins. A simple Pinterest search will give you hundreds of ideas and tutorials. In a Picture Frame :: Frame a large bill with a cute print that reads something like “Saved for a Rainy Day” or “Open in Case of an Emergency”. Get creative! Rolls of Coins or One Dollar Bills :: Fill a large box with coins or dollar bills and don’t tell them how much is in there. Instead tell them they have to count it up themselves. Give a little love right from your kitchen, or create a care package packed with favorite treats from the store. Everyone loves food and giving creative food gifts and treats can be a great way to show appreciation and love during the gift giving season. Making your own treats and eats can also be a frugal gift too, especially if you plan ahead and make in bulk several gifts at once. Cookies and Baked Goods :: Whether you are a baker yourself, or you have access to an amazing local bakery, baked goods are always perfect gifts. They are especially great to make and pass out to your neighbors or the staff in your office. Chocolates or Candies :: I live in Kansas City, home of Russell Stovers, so chocolate boxes are big time around here. Whether you love making fudge yourself, or you fill a dollar store glass jar with their favorite candy, sweet treats are always a hit. Homemade Hot Chocolate Kits :: These are especially fun to make with the kids, and a Pinterest search will yield hundreds of creative ideas from snowman jars to decorative bags, hot chocolate kits are so fun, especially on cold, snowy nights around the fire. Tea or Coffee :: Fill a mug with favorite tea bags, K-cups or a bag of gourmet coffee. Include some cinnamon sticks for stirring. Canned Goods :: Are you a champion canner and have a pantry filled to the brim with homemade applesauce, jams, pickled vegetables or tomato sauce? Give a few of your homemade treats to a fellow food lover who you know would enjoy them. 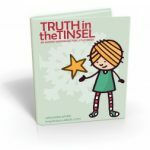 What could be more in line with the spirit of Christmas than donating to an important or thoughtful cause or charity? Many times you might be at a loss of what to buy for a family member or friend because they really don’t need or want anything. If you are worried about food allergies or not sure of their favorite stores to purchase gift cards too, perhaps donating to a cause that’s important to them would be a truly meaningful gift. 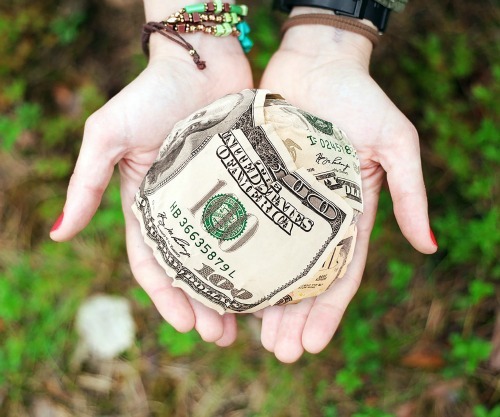 There are a ton of wonderful charities to donate to and really do benefit when people support them through monetary gifts, in fact, that is their main way to stay in operation! Please do your research, though, while most charities are well trusted, scammy ones are always popping up especially this time of year. Also, do your research on the organization yourself. Where do they place their donations? What do they believe and support? Are they ethical? Are they faith based? Are they a charity you and the recipient of your gift would be proud to have your name associated with? Church :: Give a gift to the person’s church in their name. Ministry of Choice, either locally or globally :: Do you know a ministry that person has personally been impacted by or supports? A thoughtful monetary gift to that ministry in their name is truly touching. Sponsor a Local Family for Christmas :: Adopt a family in need through a local organization, and provide a Christmas meal, some home necessities and gifts to that family in the person’s name. Disaster Relief Efforts :: We live in a fallen world where traumatic events happen every day. Make a donation to a relief ministry or cause that will benefit those who desperately need it. Hospital or Health Care :: If the person is especially active in health care related activities, such as cancer research or heart health, donate to the cause in their name. Any non-profit :: The options are truly limitless and there are so many wonderful charities to support from food assistance to education. Offering yourself in a gift of service is almost always appreciated! Depending on the person, it might be so much more meaningful to offer your service and time than any physical gift. And as with all of the above-mentioned gifts, you can always dress it up and offer a creative coupon book or write a thoughtful card or letter explaining your gift. House Cleaning :: If you can afford to pay for a housecleaning service to bless someone in your life, go for it! Or you could volunteer your time and service. Do be sensitive about it though, while I would hands down accept any gift of house cleaning, some might take offense to it. Home Repairs :: Are you handy? Offer your services to help fix anything around their home that needs to be fixed, painted or repaired. Yard Work :: Love to mow the yard, rake leaves, shovel snow? Offer this act of service to someone who could use the help. Child Care :: Especially helpful to any young mother, volunteer your service for a morning or afternoon so the mother can have some time or during the evening for a much-needed date night. Car Wash :: A car wash can be a wonderful gift, go the extra mile and detail the car too! Cooking of a Meal :: Provide a dinner or come over and cook for them. You can even make it an event by offering a food and wine tasting or cooking lesson. Bible Study :: Do you know someone who is new to the faith or could just use some time with other believers but seems overwhelmed to join a large group Bible study? Offer to lead them in study for a few weeks, who know… what might start out as a simple gift, could end up making eternal impacts in the lives of them and their family. Fellowship :: Offer your time and fellowship with a weekly or monthly coffee date or game night. Sometimes all the person really wants is just to spend time with others and build friendships, especially the elderly. Gifts of Experiences are also great clutter-free gift ideas and I be sharing a whole post full of those in a few weeks as part of this Holiday Gift Guide series so stayed tuned! 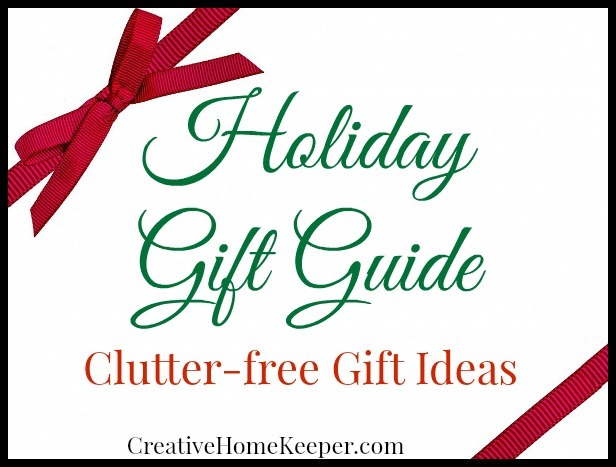 What are your favorite creative, practical and meaningful clutter-free gift ideas? I love the idea of giving acts of service! This is a really great list of ideas all around. Thank you. Wonderful gift ideas, especially the gift service! 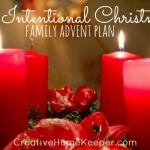 I love the ideas on this list, especially the service gifts listed at the bottom. We always give to the Samaritan’s Purse organization. They are such a great organization! We just packed some shoeboxes for OCC! These are all such great ideas! I especially love the acts of service suggestions! This are such great ideas! We usually give gift cards. But sometimes it’s hard when they are little kids and they want toys LOL…. But when we give gifts to 7 YO and older a gift card is the way to go!!! Love a few more ideas that I might put in practice! Thanks! 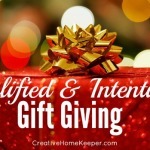 Yes most of these ideas are definitely geared towards older kids, teens and adults, although this year I’m including my own kids into the “giving” of gifts of service to help their little hearts learn to love other people. I love gifting gift cards and certificates to go to the spa–it’s something everyone appreciates, and most likely people won’t buy it for themselves. Great ideas! These are all such fantastic ideas! I love them! I can use many of them for my family and friends this year. I’m getting really excited about the holidays. It will be wonderful! Megan I’m getting excited too! I love all these ideas. And I’m kind of jealous of how close you live to Russell Stover. Their French chocolate mints ares my favorite. I saw on pinterest a cute idea for giving money. Someone had filled a pizza box with dollar bills fanned out in the shape of a pizza. Pinning this!